Javier Piñeda and his sleeping 10-year-old son huddled in the dirt with a group of Central Americans from the caravan, who were eyeing their latest obstacle: the US border fence and the agents who patrol it. Piñeda was one of about 30 people who’d walked two hours to get here. They’d been kicked out of the sports complex where they’d been housed since arriving in Tijuana about two weeks ago, but instead of moving to the new shelter authorities had set up on the outskirts of town, Piñeda and the others had decided they’d try crossing the border along the beaches, where Tijuana meets the Pacific Ocean. Some carried only the clothes on their backs, but one man had wrapped his cellphone in a plastic bag in case they were forced to swim. Others had left their clothes behind with friends in case they couldn’t make it into the US and returned. They had no choice, Piñeda said. Piñeda believes he has a good asylum claim, but can’t afford to wait months for US border authorities to give him the chance to ask for refuge. The 32-year-old has four kids, including a baby who was a month old when he left home in mid-October, and a wife back home in Honduras who depend on him to make enough money for them to eat. He didn’t believe that he could support his family on what he might make in Mexico in the months he was likely to have to wait. The decision to strike out for the US on his own, without presenting himself for asylum at a port of entry, is a common one as the US asylum system grinds to a halt from the sheer number of applicants and the Trump administration’s determination to make it more difficult to present a claim. More than 5,000 people are on the waiting list to ask for asylum in Tijuana, with more arriving daily. Immigration advocates have long complained about the US practice of “metering” — allowing only a few asylum-seekers to make their case each day — and a recent Department of Homeland Security inspector general’s report found that the practice, forcing hundreds of people to wait weeks just to apply, pushes asylum-seekers to cross into the US illegally, instead of going through official ports of entry. So Piñeda and the two dozen or so other members of the caravan found themselves doing what uncounted others have done before them — looking for a way to skirt the wait to get into the United States. It would be a lesson in what a Border Patrol agent once described as a high-stakes game of hide-and-seek. Now it was 2 a.m., and the trip already looked to be over before it had really begun. A man in a red jacket had breached the US border at the bottom of the hill they were hiding on, attracting the attention of the Border Patrol. “Stop,” yelled an agent to the man as he walked with his hands up in the no-man’s-land between two border fences at Playas de Tijuana, a beach that abuts the United States at the San Diego County town of Imperial Beach. 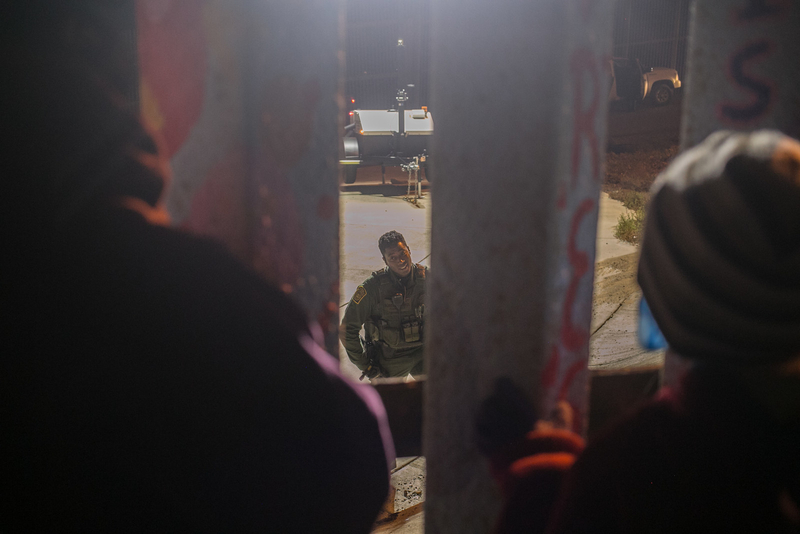 A white and green Border Patrol SUV pulled up near the group, just feet away on the other side of the first border fence and behind two unspooled stacks of razor wire the military had recently placed there. People rushed for cover under a tree. The driver pointed a flashlight at the group, and for several minutes everyone froze. The dirt they sat on was wet and the smell of feces clung in the air, but it was no use trying to figure out how close anyone was to the source. Piñeda’s son, Freddy, snapped awake as the group pushed into one another, sure they’d been spotted. Piñeda’s brother had been killed in spring 2016 by MS-13. Police found his body covered in burns from melted plastic the gang had dripped on him before they killed him, Piñeda recalled, trying not to make a sound as the tears fell down his cheeks. He filed a police report against the gang member responsible but it led only to death threats, and his family had to move to another city. The gang eventually caught up with them, slipping notes with “MS-13” written on them under their door and posting threats on social media. When Piñeda saw a caravan was leaving Honduras for the US, he grabbed his oldest son and ran out the door with $4 in his pocket. That money was long gone as he huddled near the border fence. Piñeda’s recollections were interrupted when a helicopter suddenly appeared overhead, its blades chopping the misty air as it hovered above the 30 people from the caravan. But the chopper seemed to be more interested in a different group of men, women, and children who were closer to the border fence and had focused its spotlight on them. After a few minutes, it flew away. Piñeda’s group sat in silence, wondering what to do. The murmur of hushed conversation built. “For the love of god, be quiet,” a woman urged. “What if we all jumped over at the same time?” another man said. The group huddled together in the dark, unsure of what to do now. 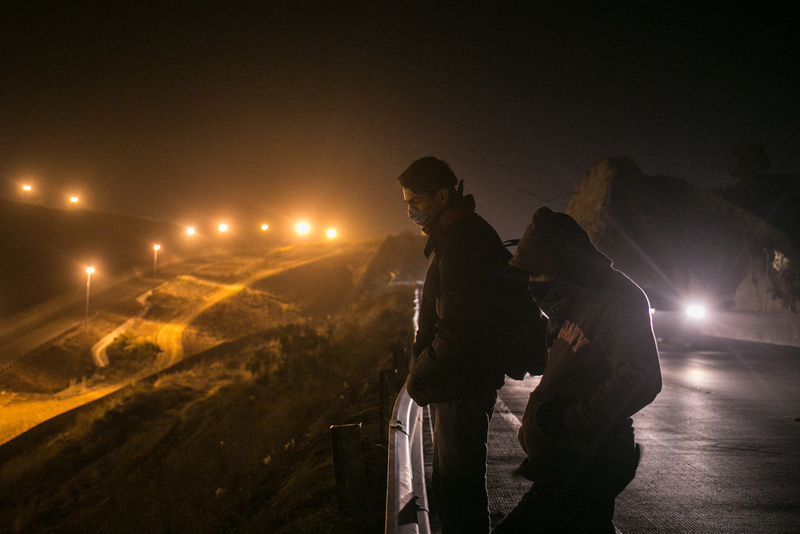 Two members of the caravan, who declined to give their names, look at the border wall from the highway in Tijuana, Dec. 1. All night long, Playas de Tijuana had been the scene of scattered attempts to cross into the US. At about 9:30 p.m., a group of four men had somehow made their way across and ended up turning themselves into the Border Patrol agents who rushed to the area. 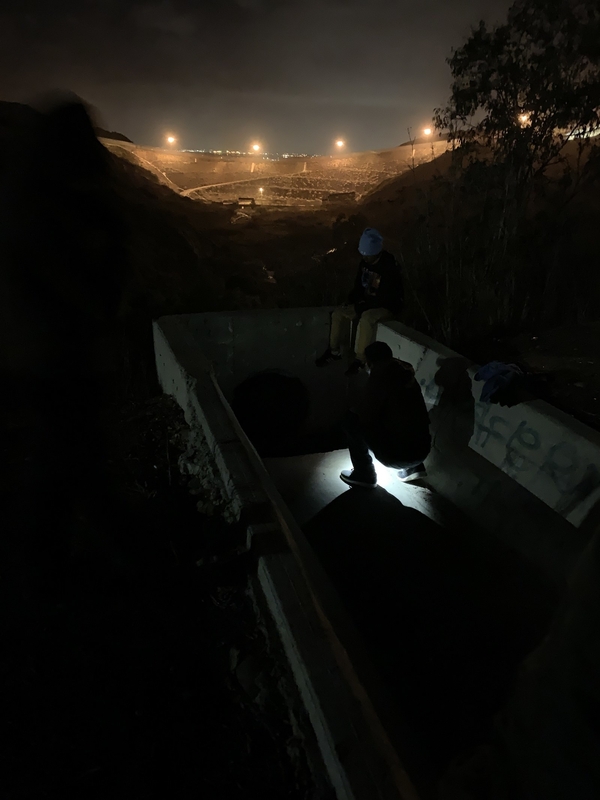 At about 11 p.m., César and Daniel, two 18-year-olds from El Salvador, took turns digging into the dirt under the border fence with their hands until there was a hole big enough for them to slip through. They took off the layers of clothes they’d worn to fight the cold and placed them between the posts that make up the first border fence; they’d grab them once they were on the other side. César went first, his sneakers sticking out of the ground on the Mexican side while his hands pulled the rest of his body into the US. Once he was fully in the US, he hid under some bushes while Daniel made the same entrance. But the Border Patrol quickly spotted them, and the two friends scrambled back into Mexico when they heard the agents’ four-wheel all-terrain vehicles on the ridge above them. They hid behind the border fence, out of breath, and talked about what to try next. They’d heard there were some tunnels nearby that they could take into the United States, so the two men walked along a dark highway in search of them, with cars speeding just feet away. In El Salvador, they both were being pressured to join gangs — repeated rejections often led to death, so when César heard there was a caravan moving through Central America, he decided to join it. Now that the US was in sight, he didn’t want to wait weeks to ask for asylum. If they got caught, they’d ask for asylum then. “My destiny is not here, my destiny is on the other side,” César told BuzzFeed News. César, who wore an oversize Tupac Shakur T-shirt with the words “Me Against the World,” didn’t tell his family when he left El Salvador. He called them days later when the caravan was in Huixtla, in the Mexican state of Chiapas. They were surprised, César said, but mostly angry that he had left without saying goodbye for what could be years — if he managed to make it into the US. César and Daniel inspect a pipe that appears to lead toward the US. Now César and Daniel, joined by two friends they’d made from the caravan, were checking out an open-air concrete water channel that goes into the US from the slope they were perched on. A Border Patrol truck was waiting on the other side, and they moved on. A set of brightly lit sewer tunnels a few minutes away were sealed off. Further down the road, they inspected a steep, pitch-black pipe that led to the border but it was too dark to know where it would drop them off. They’d try to cross the border another day and walked an hour back to the shelter. At about 3 a.m., Piñeda’s group called it quits and slowly started to walk back toward the nearby beach, where they planned to wait for dawn before walking back to the outdoor stadium. Freddy looked at the ocean’s thrashing waves and thought that even the water was mad at the migrants. As the group walked along the border fence closer to the ocean, a green-clad Border Patrol agent with black cloth partially covering his face approached. One of the migrants told him that the wait at the San Ysidro Port of Entry to ask for asylum was too long. That’s the way the law is in the United States, the agent said, and it’s against the law to cross into the US without a visa. “If you try to cross, good luck,” the agent said in Spanish. The agent walked back to a group of six of his coworkers, who watched the group settle in for the remainder of the night on the concrete floor of a tourist spot with a statue of three dolphins that overlooks the ocean. Piñeda covered himself against the mist with a black plastic bag and helped his son into a thin raincoat. “We’ll try again tomorrow,” Piñeda told his son. A Border Patrol agent interacts with a group of migrants looking for a way to enter the United States.